Received in 1949 as a gift from the government of the Mongolian People's Republic. Before the formation of the People's Republic (1924) secular art in Mongolia was practically nonexistent, although certain elements of secular subjects occasionally penetrated into graphic art, painting and sculpture. After the victory of the revolution and the establishment of the People's Republic, Mongolia faced the task of developing a new, realistic art. Contemporary Mongolian painting was largely influenced by Soviet art, especially since many young Mongolian artists received their education in the Soviet Union. It developed in two directions: the mongol-dsurag trend which maintained the national traditions and the other trend which was concerned with the principles of oil painting. Some artists adopted a mixed style equally inspired by classical Mongolian painting of the later period (the late 19th and early 20th centuries) and Western European lithography. Their works gradually acquired certain realistic traits and revealed a growing interest in factual precision and the meticulous attention to such aspects as volume, texture and light-and-shade effects. 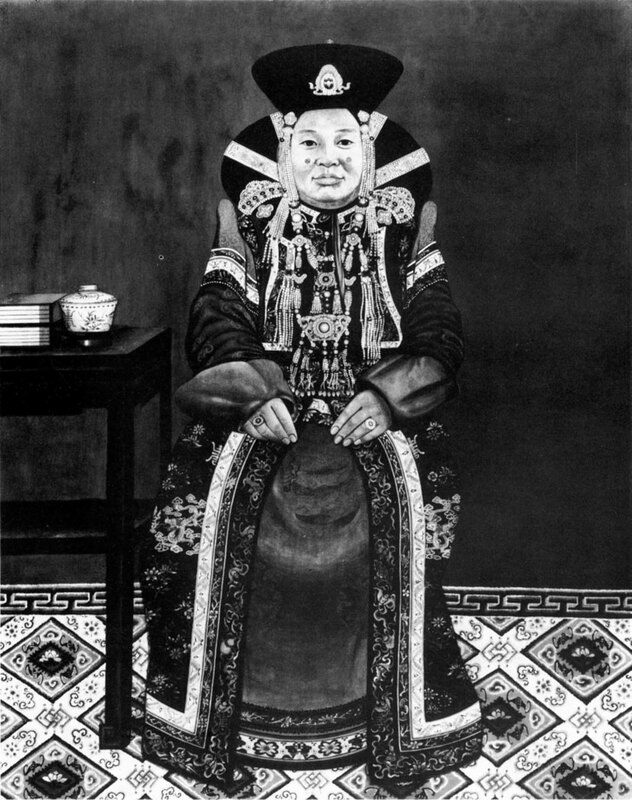 Djalsarai's Portrait of a Woman in Traditional Costume is one of the most interesting examples of this trend. The robe worn by the woman is a typical Mongolian dress suitable for both men and women. The material is Chinese patterned silk in blue, which, according to the traditional Mongolian symbolism, meant loyalty. Especially interesting is the woman's coiffure, which is also traditional. It evokes an association with the spread wings of the flying Garuda, the fantastic bird which was worshipped as a protector of the country. Received in 1971 as a gift from the government of the Mongolian People's Republic. First publication. The celebrated artist Nyamosorin Tsultum is renowned as one of the best landscape painters in Mongolia. His art bears an influence of Russian landscape painting, which is natural considering that his teacher was the well-known Soviet painter Sergei Gerasimov. Tsultum was the founder of Mongolian lyrical landscape painting. In his work he is inspired by his native scenery with its boundless steppes and snow-covered mountains. He portrays it in his pictures with a deep understanding and true emotions. Received in 1971 as a gift from the government of the Mongolian People's Republic. Chogsom is one of the leading contemporary artists in Mongolia. He was born in Ulan Bator and attended the Art Institute there. Each of his paintings is a manifestation of his creative pursuits of new methods and techniques. In this canvas a concrete view seems to grow into a generalized picture of the world as perceived by the artist. It is striking with its unexpected combinations of colour and a brilliant decorativeness. The large areas of pure colours, the clarity of lines and silhouettes, the deliberate flatness of treatment and the vertical brushstrokes evoke an association with an ornamental carpet. The pink mountains with their bright blue shadows, the blue river and the yellow sand are vibrant with vitality and exultation.